Beginning today, OnTime offers a new feature to help improve communication between drivers and dispatchers. In the past, it has not always been easy for dispatchers to know when and for how long a driver is available for work. This can be further complicated when drivers are independent contractors and do not have a set schedule. To solve this problem, OnTime now includes an Availability feature. 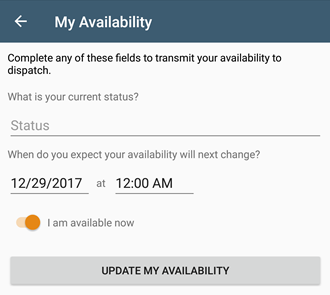 This allows a driver to quickly and easily set their current availability from one of the OnTime Mobile apps. 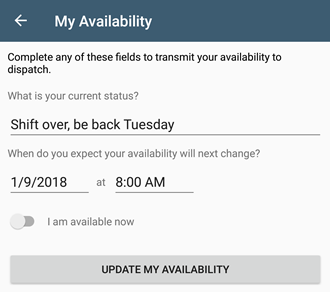 In addition to setting their status as “available” or “not available”, drivers can include a description of their current status and a time at which they expect their next status to change. 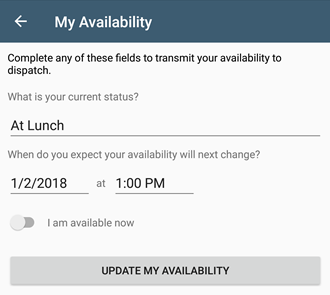 A driver can change their availability by tapping on the yellow or green bar across the home screen of an OnTime Mobile app. A driver can update their availability details as often as necessary. This information is immediately relayed back to users of OnTime Dispatch. The new Availability feature allows a dispatcher to see the current availability of all drivers. Perhaps more importantly, a dispatcher can see a description of each driver’s current status and when that’s expected to next change. This helps the dispatcher to more accurately predict availability in the future. A driver has just started his lunch break and is unavailable for the next hour. Example: Shift over and on vacation until Tuesday. A driver has just ended their shift and due to a planned vacation, will not return at the normal time the following week.